Provo bicyclists have Douglas Crow in their thoughts today, a father and BYU employee who was killed while riding his bicycle to work a year ago. Wishing the Crow family peace during this difficult anniversary and encouraging everyone to be aware of cyclists while driving in Provo (and everywhere else). A memorial Ghost Bike is still found on the fence near the FrontRunner crossing near 700 W. and 600 S. Thank you to Kent Sanchez for arranging the Ghost Bike a year ago and for the video. Ghost Bike – Going to Location. Tri. from kent sanchez on Vimeo. We need your support. Douglas Crow, was tragically killed on his bicycle on February 15, 2013. A ghost bike memorial was placed at the location of his accident, near a train crossing. Now the Pacific Union Railroad has taken down his memorial. 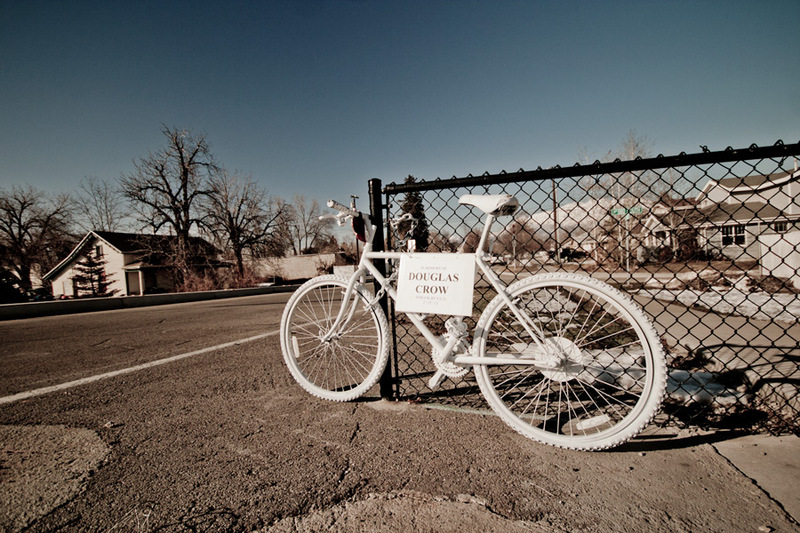 Please help us create a new, permanent ghost bike memorial in Provo City. Please make a small [or large] donation to help fund this project. If you can’t donate then please share this will all of your friends, family and contacts. All extra funds will be donated to Provo Bicycle Collective. The Ghost Bike memorial for my Dad that so many people generously donated to create will be dedicated on May 20th in conjunction with a WORLDWIDE Ride of Silence. We would love to get as many people out as possible for support. This is a great event for everyone (adults and kids alike) and for a wonderful cause. You don’t have to ride a bike to come out and support those who do. Please share, promote and plan on attending this event.